Vegas or bust! The Desert Tour was simply four friends flying to Vegas with a little road trip for good measure. I’m just going to say this about Vegas: it was a blur. We drank, we walked a lot, and we did the Vegas thing. We were fortunate to have a great hotel thanks to Ryan’s mom and we were thrifty with food and drinks making it an affordable, yet fun trip. Day trips from Vegas were more interesting to me and we visited the Hoover Dam and Death Valley National Park on separate occasions between the pool drinking and the strip walking. The Hoover Dam was interesting, as always, and the work on the bypass bridge was a bit further than two years prior, but it still wasn’t complete. Our road trip into Death Valley took a whole day and included a hike at Sidewinder Canyon, a stop at Badwater Basin, and amazing sights from Dante’s View. Jenn says views at Death Valley were like looking through a filter, and she’s right on the money with that statement. Back in Vegas, Jenn and Ryan both departed on different days back to Michigan while Kevin and I headed out in the gold Camry. We left early from Vegas and headed up towards Arches via I-15. On this journey, we saw the Virgin River Gorge for the first time and it was most impressive. It had been pretty mundane and brown driving north and then all of the sudden, we’re in a canyon with tall walls and some color. We made a stop after that in St. George, Utah for Starbucks and to check on the weather for the road ahead. It was snowing and the snowstorms all the way to I-70, but we went ahead anyway. We stopped for gas, after an adventurous journey, in the Green River area and then proceeded down 191 to Arches. We were famliar with the park from last year so this year our visit was focused on hiking to Delicate Arch. The weather was mixed with clouds, rain, and enough sun to encourage us to go forth and hike up to the iconic arch. I recently (August 2018) did this hike and looking back to 2010, I don’t remember much of it at all and without pictures I really only remember being up at the arch itself. To get up to Delicate Arch one starts out on a well definied trail which transitions to a rock face until a rock ledge is reached that leads to the area where the arch is located. Once up there, it’s a bowl of red rock and Delicate Arch is on the edge. The views out are spectacular and the arch itself is much bigger in person than the perception from lower viewing areas. I do remember we were two of maybe four or five people total up at there, as it was March and the weather was less than perfect. When we looked out from the arch, we saw mountains in the distance and snow covered red rock just below. The contrast of white on red was a brilliant contrast when the sun peaked out from behind the clouds and made for some great photos that day. We hiked back down to the car and proceeded south to Monticello, Utah where we’d stay that night. The hotel in Monticello was less than amazing, but it was comical and made us laugh and question our choices all at once. We were spoiled in Vegas, our friend hooked us up with an apartment style hotel room with mountain views and now we had light fixtures falling down and a strong Pine-Sol odor. We hit up one of the only restaurants we saw open and had dinner as it started to snow. We came out from dinner to almost a foot of snow and were just a little shocked, as we had a Toyota Camry rental car and big travel plans for the next day. A little snow never stopped us before, and this trip was no different. We woke up to even more snow than the night before, but a little sunshine too. As far as I the eye could see was covered in a thick white blanket of fresh powder and we had to try and get to the Grand Canyon today. The more we drove and checked around, the more it felt unlikely we would be visiting the Grand Canyon this trip due to weather and distance. Alternate plans were made to go through Capitol Reef to Bryce Canyon and back to Vegas via Zion. It was one hell of an alternate plan but the sights and parks along the way are a large part of why I'm in love with public lands today. No regrets, even if it was a little nuts with the snow. 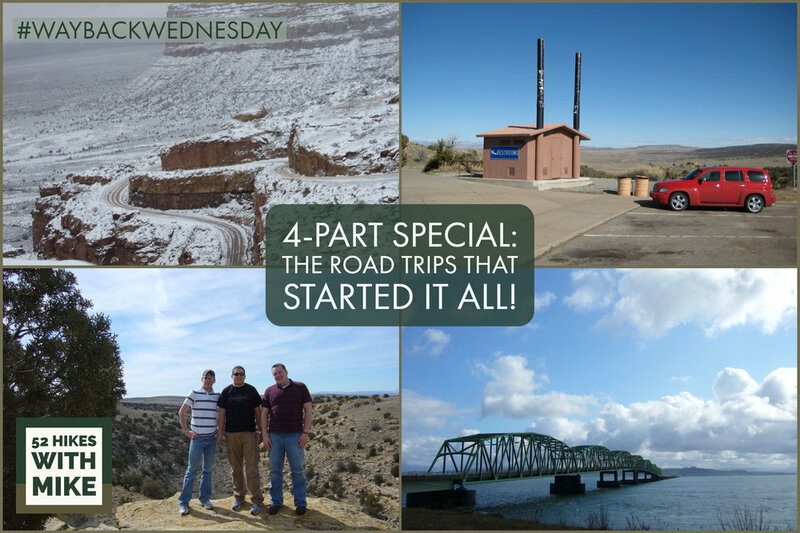 The roads on our journey between Monticello and Bryce Canyon were less than ideal, but it made for one of the most memorable road trip adventures of my life. We started on US-191 south out of Monticello and were going to take Utah 95 over from Blanding, but it did not appear plowed or even having tracks, and so we decided to through Arizona over through the Glen Canyon area. Being in the area last year, we were somewhat familiar, but still were just flying by the seat of our pants. From US-191 in Bluff, we headed west on US-163 towards Mexican Hat. We found Utah 261 north, through what is now Bears Ears, and took the narrow, winding road and It was a wild ride of slushy mud and proved to be pretty intense with no guardrails or plowing. Why we decided to go down and then up, I have no idea, but we did and it's what happened. I feel, ultimately, we were indecisive and didn't know what we wanted to do, but I can't be sure. We made it through, to the top of the plateau, and plowed snow with the Camry until we found Utah 95 after all. We took Utah 95 up to Utah 24 through Capitol Reef and on along the Utah 12 Scenic Byway. Highway 12 went all the way to Bryce Canyon. I’ll include a map and some photos of the journey to bring it all together. I did not know much about Capitol Reef before this trip, but once we started driving through the area it was apparent why it was designated and preserved. I’ve never seen anything like that area, the landscape was as if I were on a different planet. When we were up a little higher in elevation, we could see for miles and miles and it was rocks in varying shades of rusty red as far as the eye could see. Arriving at dark wasn’t the most ideal time, but it worked out because Kevin had plans for us to go look at the expansive sky since Bryce Canyon was a dark sky park. We checked in to the Best Western just outside the park and managed to score a great off peak price and room. We entered the park, and sat in a dark parking lot for about twenty minutes before venturing out to an area out from under the trees. The night sky there was unlike any other night sky I had ever seen. We saw billions of stars and the Milky Way with ease. We spent some time there, taking it all in, before heading back to the hotel to take advantage of the heated outdoor pool and hot tub. The temperature was 20 degrees, but fell to zero with the windchill, and there were piles of snow surround the hot tub but it was by far the coolest hot tub experience I’ve had to date. Morning came without fanfare or sunshine, but we went back into the park to explore the areas that were open for the winter season. We were able to see Inspiration Point and Bryce Point and trek through snow to get good views of the rim. There was four feet of snow covering many parts, but the viewpoints were cleared so we could enjoy the snow covered hoodoos. White and rusty orange for as far as the eye could see. If you haven't visited in the winter, or at all, please add it to your list - you'll be amazed. It was a short drive from Bryce Canyon to Zion National Park and it went well with more sun as we pushed west and south. We left Bryce Canyon pretty early so we could maximize our day at Zion and maximize we did. Our grand plan was to do Angel’s Landing, and part of me wishes we would have, but we didn’t and it I'm okay with that. Knowing what I know now about that hike, we were smart not to do it in the little daylight we had and the previous weather. We settled on the Emerald Pools hikes instead and I have zero regrets. The views from spots along the trail were encapsulated the variety and beauty of the park. Honestly, I'm not sure I was physically ready to hike Angel's Landing, plus there were warning about icy spots where the sun hadn't hit. Zion was another surprise, as I hadn't researched the park before going. We had great weather and managed to see quite a few of the hot spots in the short time we had there. Along with the Emerald Pool trails, we visited the lodge and had lunch, hiked back to the beginning of the narrows and enjoyed the scenic drive through the park. Never in my life have I seen such red rock and trees sprouted from them. After a full day at Zion, we made the trek back to Vegas for one more night so we could catch our flights home in the morning. We used Hotwire.com to book our final hotel because it sounded like a fun way to get 5-star accommodations with a little surprise. The surprise paid off, as much as I hate to admit, because the hotel was immaculate. We rolled up in our rental Camry to a valet only parking situation, with trash from a few days all over the car and mud up to our knees from hiking all day. The lobby had polished marble floors and fancy chandeliers and we felt very out of place but the room was nice and had a Jacuzzi. The pool area looked over the strip and had views of the Wynn and Encore. At the time, the brand didn't have such a negative connotation, but now I'm afraid to even list it in here. I'll see if you can guess where it was from the pictures (Hint: it looks like a golden french fry on the north end of the strip). I spent the final night in Vegas relaxing before heading out to the strip, while Kevin went gambling for a while beforehand. It was a great way to wrap this trip. Not all trips go according to plan, but they can usually be salvaged or offer a good story for years to come. I’m not saying this trip was the best, but it did have some highlights and good times all around. We learned to adapt quickly to changing weather patterns, which is common for most travels but not something we had extensive experience with. I learned about these beautiful public lands and fell in love with these national parks. To this day, I long to be back at Bryce Canyon or Arches on a monthly basis. We can say we did the Vegas thing, and it wouldn't be the last time we'd whoop it up there and probably not the last. It's a great hub for adventure, with cheap flights and cheap lodging. Flying into Vegas, renting a car, and traveling to Utah, California, or Arizona is so easy with an abundance of gorgeous public lands within hours from the airport. This trip sealed the deal for me that road trips to and through public lands are my preferred mode of vacation. This was the last big trip I took before moving to Texas, and with the previous three set the state and expectations for all future trips. I found my spirit on these trips and I have never felt so alive. Enjoy the views, the scenic byways, and roadside attractions along the way!